Website optimisation is the process of reviewing and improving a website’s organic rankings to appear higher in search engine search results. Chameleon offer professional website optimisation services known as Search Engine Optimisation or SEO. With the Internet being the largest place for consumer shopping, appearing in search engine search results for your products and services is one of the most important factors to run an online business and it is now more important than ever to ensure that your website is search engine friendly. When a website has optimisation carried out the website will not only be more search engine friendly but also our experts working with online websites all day long will identify possible ways to increase conversions and also help fix issues that may be preventing people buying online from your website. Most people do not understand the difference between organic website optimisation (SEO) and PPC (Pay Per Click) listings. Google paid adverts appear at the top and around the right hand side of the search results. These paid listings can be purchased through from Google via the service known as AdWords. This can achieve varying results depending on the competition in the sector. 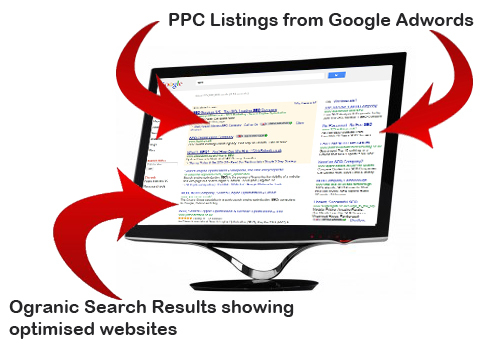 If PPC is not managed or correctly setup then this can be a very costly method of achieving sales. The biggest problem with PPC is that if you stop so do you sales. Organic optimisation means that your website will appear high up the Google listings and this will provide a long-term position that is FREE and your website will appear 24 hours a day, 7 days a week.